“I don’t like to be identified as a genius, I’m just ‘slightly faster’ than the average person,” says Jeshaiah Khor Zhen Syuen, 15. 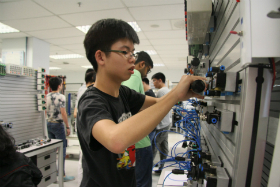 The second year Mechatronics Engineering student at Monash Malaysia is unfazed by the attention he gets for being the youngest undergraduate on campus. ‘Slightly faster’ is an understatement, given that Jeshaiah could read newspapers at one and a half years old, took his IGCSE papers at 10 and finished A Levels at 13. 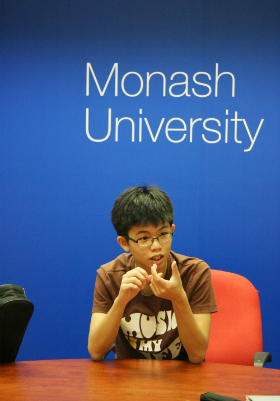 Realising he had lots of time on his hands, he took a nine month break from studies before enrolling at Monash Malaysia at 14. Currently on the Jeffrey Cheah Foundation-Sunway Group full scholarship, he made it into the Dean’s list last semester. Similarly, he taught himself guitar, thanks to Google. He now teaches other campus students basic guitar strumming through the Monash Music Club. Apart from that, he enjoys swimming, football and basketball. When it was time to choose universities, Jeshaiah had already made up his mind. Monash University was one of the top five universities in Australia and rated highly in the Times World Ranking for its Engineering faculty. It was an easy decision. 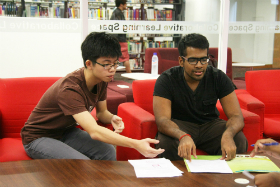 “I like the Monash degree structure because they teach you the theory in lectures and you do the practicals in tutorials,” Jeshaiah says. He chose Mechatronics when he realised that Mathematics and Physics were his strongest subjects and also out of his love for robots and Ironman. “I picked Mechatronics because I like both Mechanical and Electronic engineering as well as programming. Mechatronics involves all three,” he says, adding that Monash offers specialised mechatronics units such as Thermofluid Power Systems. One wonders if Jeshaiah encounters problems in social contexts, but he says he is comfortable around older classmates. “I grew up around people who are older than me, it’s normal,” he quips. He admits, however, that he has to switch lingo when conversing with his 15-year-old peers as opposed to older students.